The late 19th to early 20th century was the 'Golden Age' of French aperitif wines known as Quinquinas or Kinas. Kinas were originally created to make quinine more palatable when administered to soldiers in the disease-plagued 'colonies'. They took a life of their own as producers found combinations of ingredients that delighted the public and they took on their own styles following the tastes of the regions in which they were produced. Kina L'Avion d'Or reflects an 'Alps-Provence' style: White wine made from the Piedmont-grown Cortese grape is infused with Cinchona bark, Orange Peel, Wormwood and other exotic spices to give a beautiful deep golden hue, an aroma of quince and fine marmalade, with a complex, mildly bitter taste that teases the tongue as its well-balanced sweetness prolongs the finish. Wonderful on its own, chilled, on ice, or mixed with soda or tonic water, for a refreshing, low-alcohol drink. 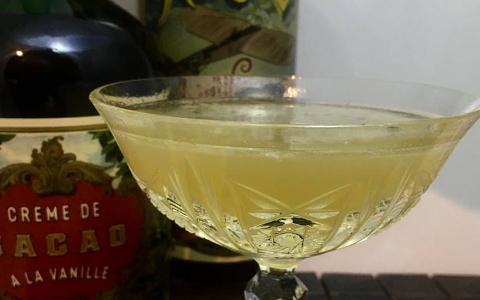 Kina Avion d'Or is absolutely spectacular in classic cocktails such as the 20th Century, Vesper or Corpse Reviver #2 and will easily find its way into many more cocktails of your own. L'Aero d'Or (The Golden Aeroplane) is a tribute to the first flight across the English Channel, made in 1909 by Frenchman Louis Blériot in his creation, the monoplane. Related links to "Kina l'Aero d'Or"
Customer evaluation for "Kina l'Aero d'Or"
Qualitativ und geschmacklich top, nur zu empfehlen. Ich trinke ihn gerne pur auf Eis oder in der klassischen Variante als Corpse Reviver . Alle Zutaten in einem Rührglas auf Eis rühren. Ohne Eis in eine vorgekühlte Cocktailschale geben. Mit einer Zitronenschale verzieren und genießen. Alle Zutaten zusammen mit Eiswürfeln in einen Shaker geben und kräftig shaken. Ohne Eis in eine vorgekühlte Cocktailschale geben. Cheers!